We enjoyed a quiet morning in the apartment and then around noon walked up to the Central Market of San Lorenzo (I promise we will branch out beyond this place, it’s just so amazing to live so close to a market like this). 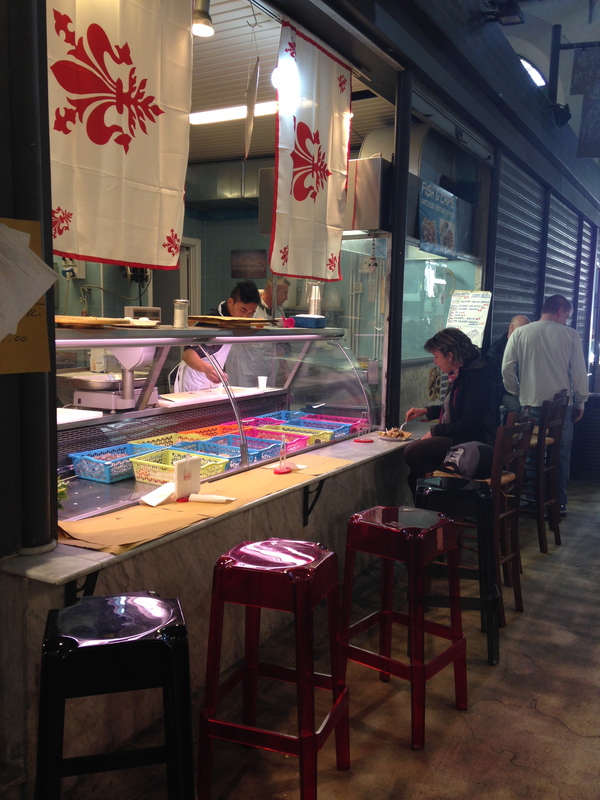 We had noticed a stand in the seafood section of the market the other day that served plates of fried mixed fish. We decided it would make a great lunch. 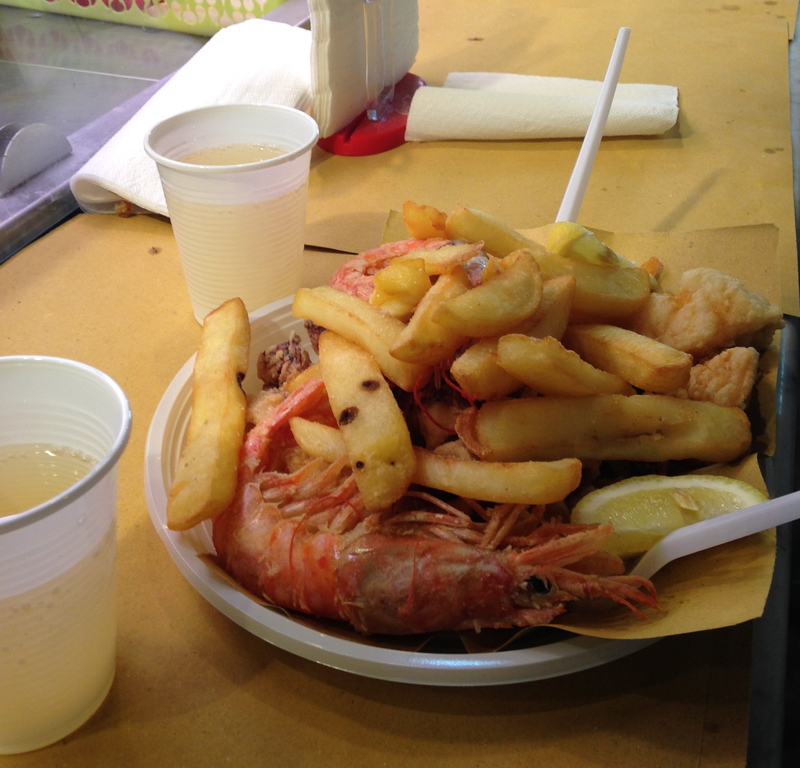 So we got the calamari – baccala (cod) – gamberi (prawns) plate with fries. The mixed fish were simply tossed in flour, fried and then served with a couple lemon slices, which was all the fish needed to be delicious. To this point, Emily had never eaten fish. We had tried tuna and salmon a couple times, but it seemed seafood was one of two things she consistently wouldn’t eat (the other being eggs). But she ate the baccala and loved it! I also love that the stand served glasses of wine for less than a coke – €1 vs. €2. And there was no choice of wine. It was just a white wine served in a plastic glass. In other words, there is one type of wine they believe goes well with this food, and that’s what you get. 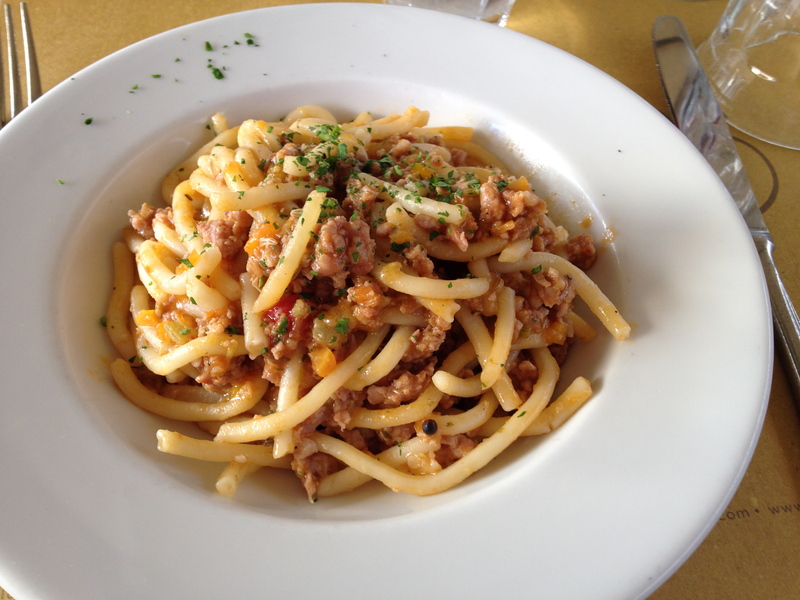 This lunch was one of the best plates of food I’ve had in Florence yet! After lunch we explored the city a bit more and found a square for Emily to practice walking, piazza della Passera. 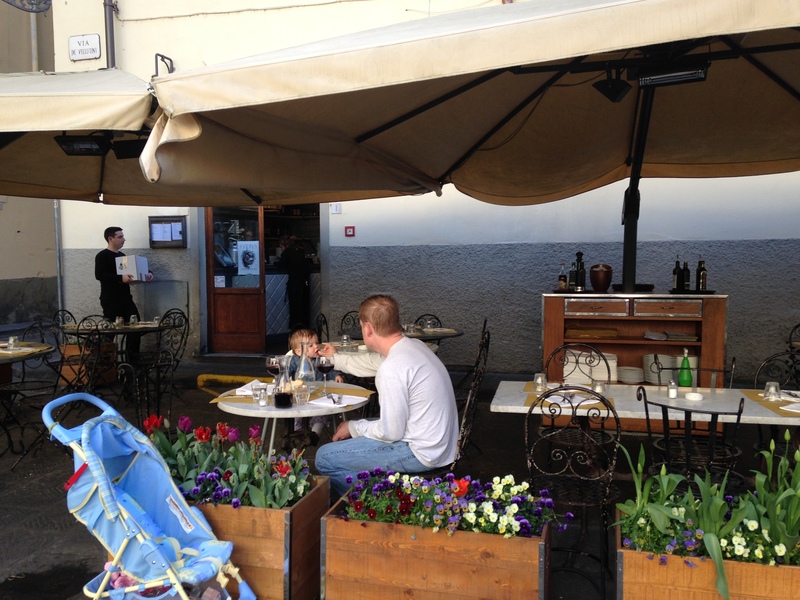 We decided to try Trattoria 4 Leoni off that square for an early dinner. This setting was the prettiest yet. The area seems to attract a lot of Italians and it was fun to people watch while having dinner. 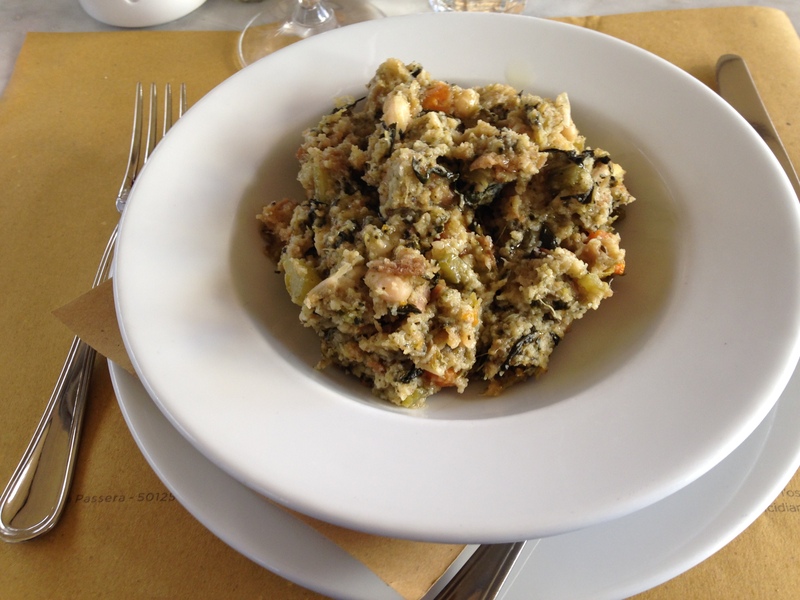 I ordered ribollita which is a famous Tuscan soup made from bread, cannelini beans and vegetables. I had been wanting to try it since we arrived in Florence. It was much thicker than I expected (to call it a soup seems wrong) and the version I had reminded me a lot of Thanksgiving stuffing. This is another dish I will be curious to compare other versions, to see if the flavors and consistency vary from place to place. Joe ordered the pici salsiccia. Pici is a thick, hand-rolled pasta like a fat spaghetti. The pasta was tossed in a sausage-tomato sauce that was heavily seasoned with fennel seeds. It was very delicious! After not having done anything too adventurous for a few days, tomorrow we plan to go on a hike to explore an area outside of Florence, and I’m working on lining up cooking classes for the next two weeks. There is a lot to look forward to!